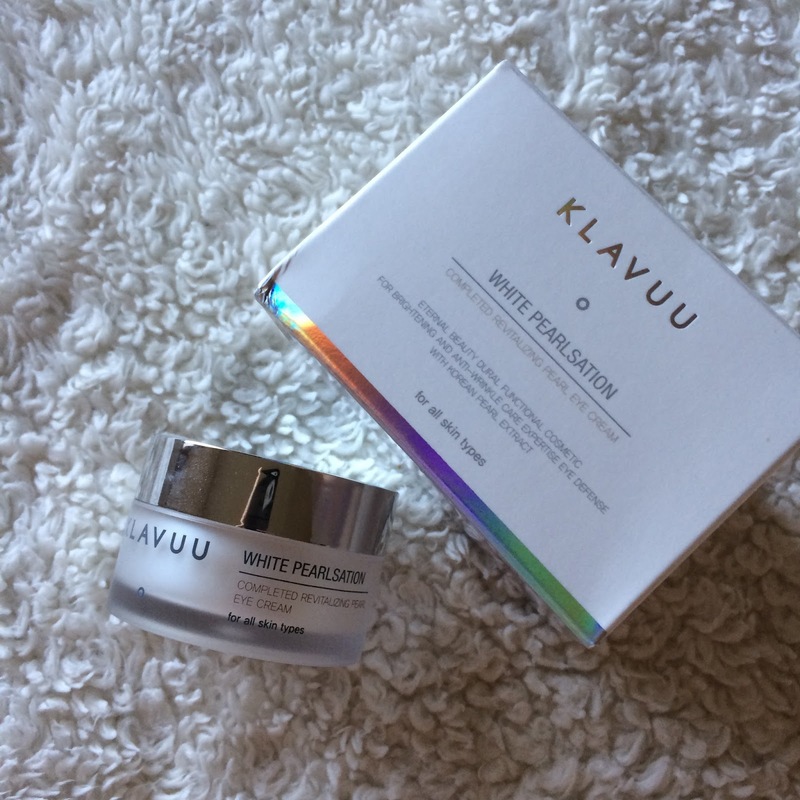 Last month I posted an unboxing from Mochi Beaute, which included a cleanser and sheet mask from Klavuu that I received to try out. Not long afterwards there was a sale, and I purchased the toner from the Pearlsation line. 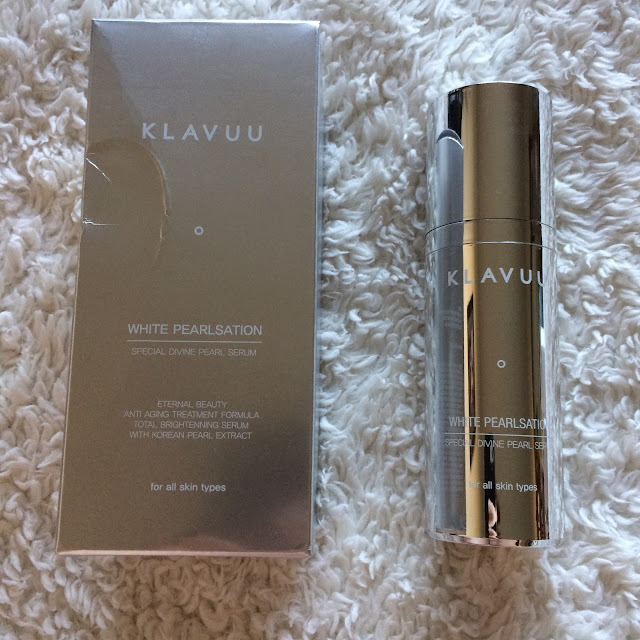 A couple weeks ago I teamed up with Simone from Can I Put It On My Face, and she purchased the Eye Cream and Pearl from from Klavuu for us to try, completing the Klavuu Pearlsation line, and giving me a chance to try everything out! I'm super excited to share my thoughts with you about everything today. 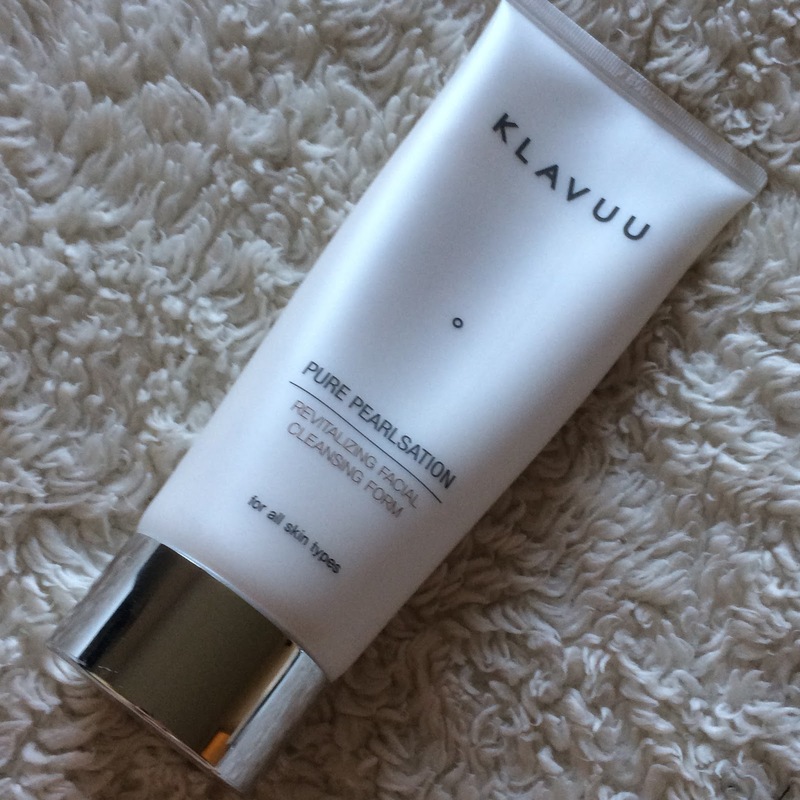 A creamy cleanser that produces a gentle, mild foam. 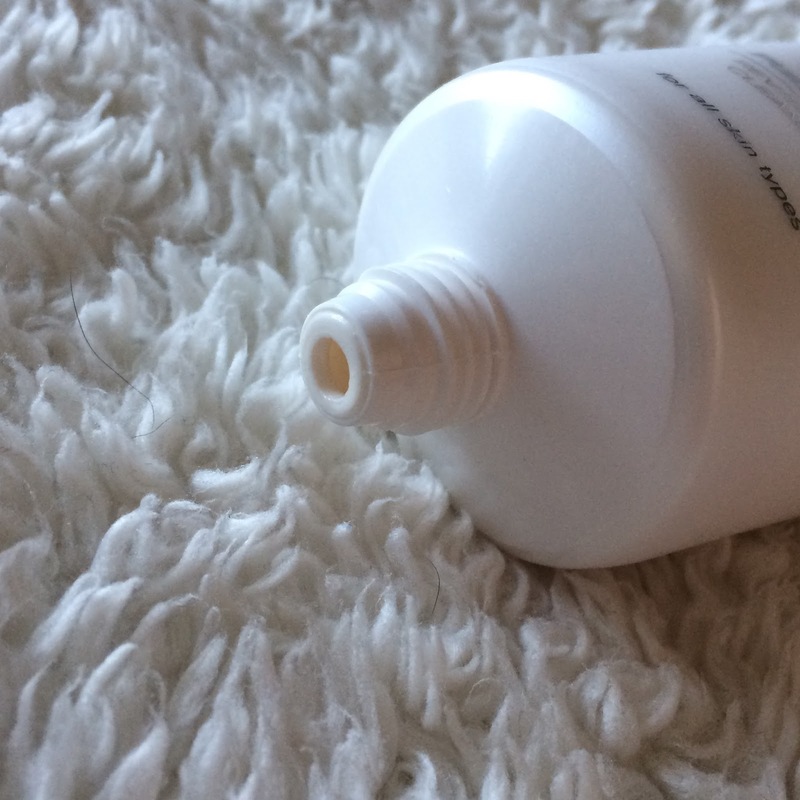 This cleanser removes makeup and residue from the skin, hydrates, and brightens. 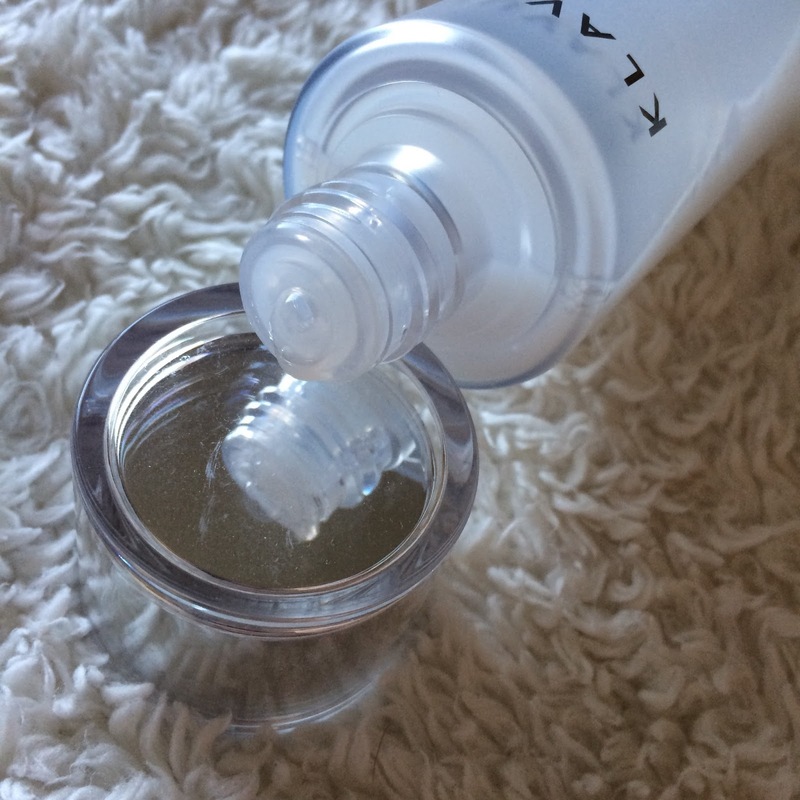 When Hanna sent this to me, my skin was changing and I was desperate for a new cleanser that was more hydrating. I wasn't disappointed! The Klavuu cleanser comes in a squeeze tube with a twist off cap. The tube is white with a bit of a pearlescent finish. 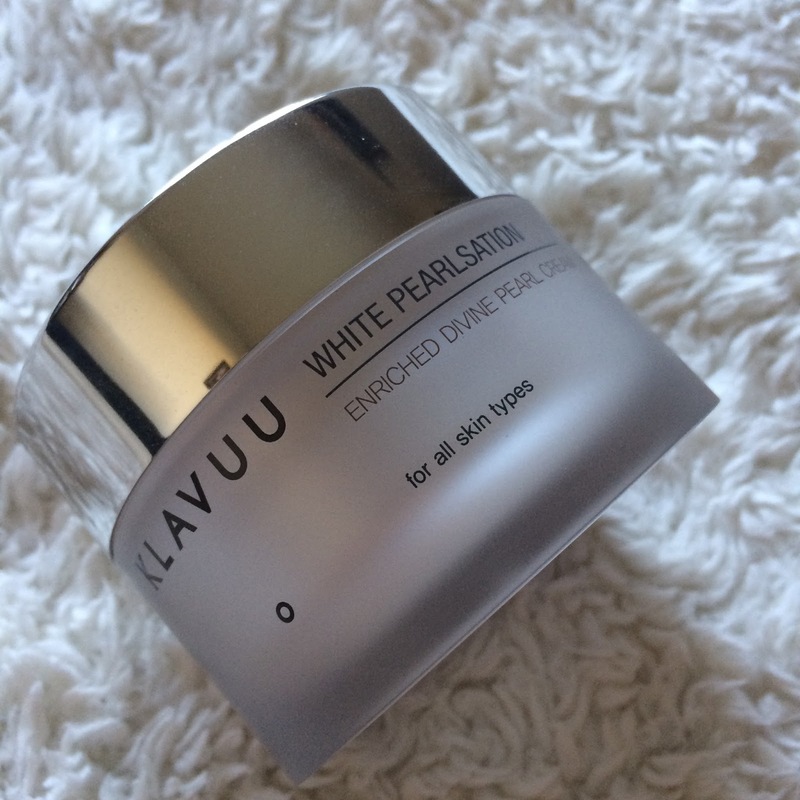 It looks very luxe, and I was happy to have this addition to my otherwise ordinary looking skincare collection. 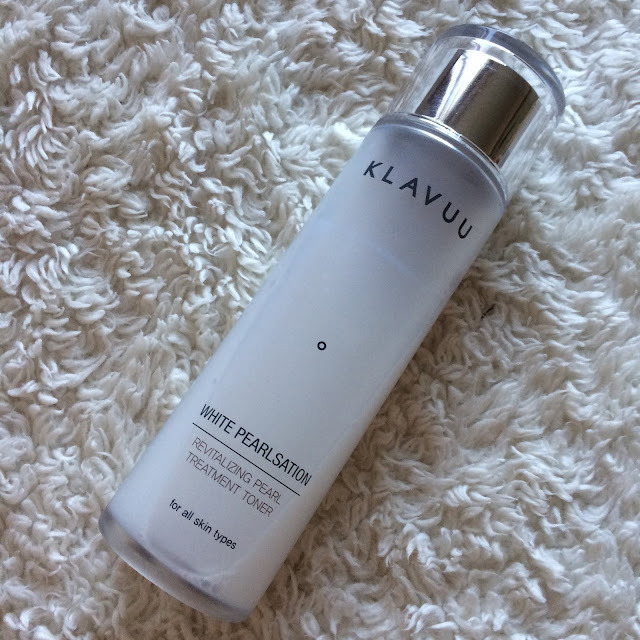 The cleanser itself is white in color with a pearly shimmer. It smells like vanilla and flowers, very beautiful and not overwhelming at all. 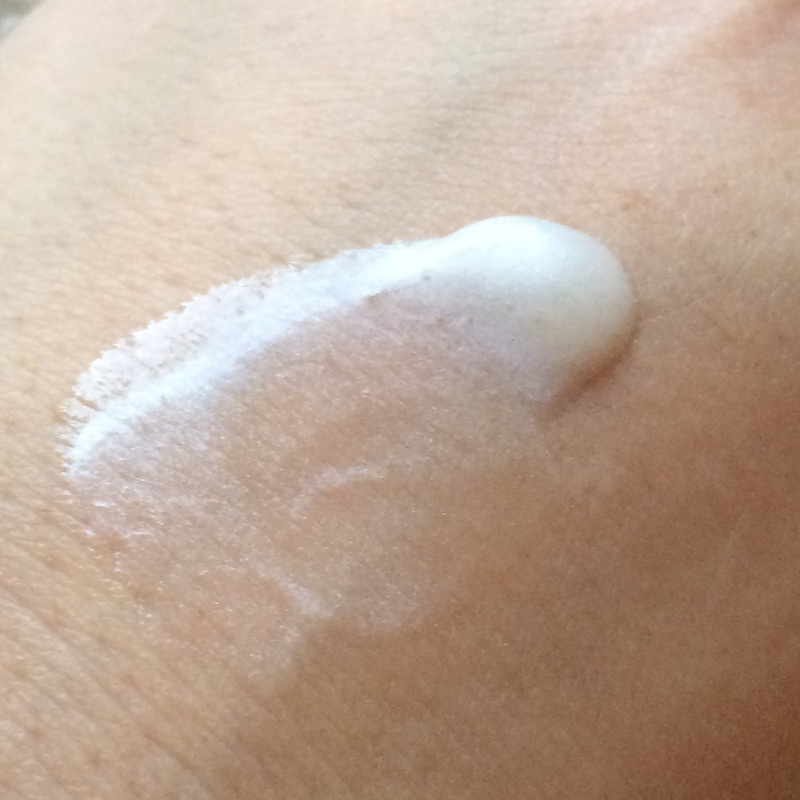 It has a creamy texture and has a lot of slip when massaging it onto your skin. I've not experienced any dryness or tightening when using this cleanser, so you can imagine my surprise when I got a pH of 8 when I tested it. I personally don't have an issue with the pH of this cleanser, since I've been using it for a month with no ill effects, but I'm mentioning it because I know this is very important to some. I showed above how creamy this cleanser is, but I also wanted to show how nice of a foam it can produce, with my handy little fluff maker from eBay (it was under $2). See this! 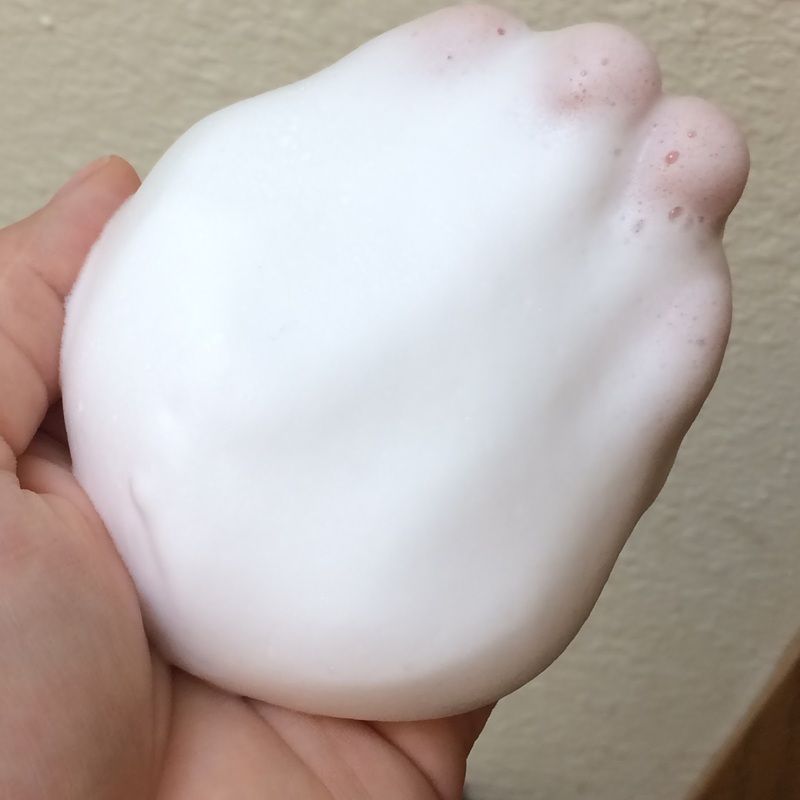 This foam is lightweight, fluffy, and feels like you're cleansing with a cloud. It's heavenly! So aside from the lovely scent, amazing texture, and beautiful packaging - this is a nice cleanser for all skin types, provided you're not sensitive to any ingredients. 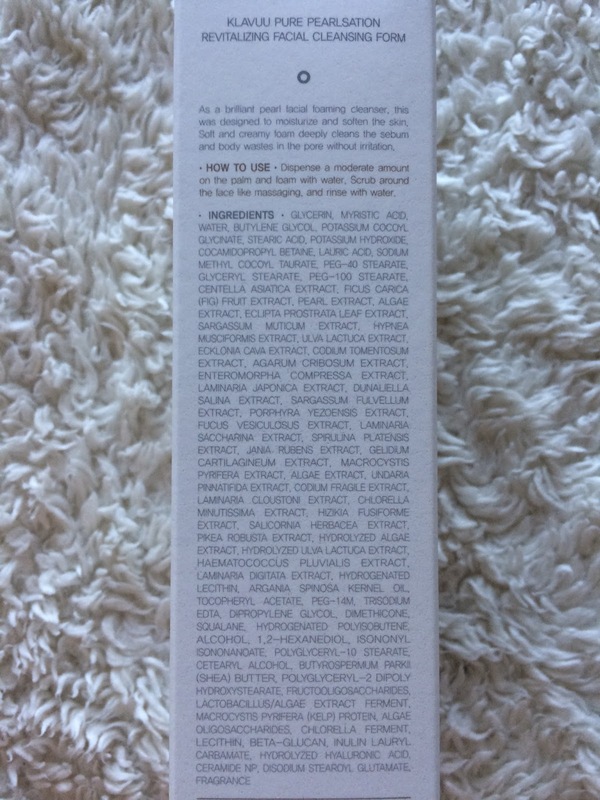 This cleanser has a lot of them, and a few triggers for sensitive skin, so remember to patch test! Ingredients: Glycerin, Myristic Acid, Water, Butylene Glycol, Potassium Cocoyl Glycinate, Stearic Acid, Potassium Hydroxide, Cocamidopropyl Betaine, Lauric Acid, Sodium Methyl Cocoyl Taurate, PEG-40 Stearate, Glyceryl Stearate, PEG-100 Stearate, Centella Asiatica Extract, Ficus Carica (Fig) Fruit Extract, Pearl Extract, Algae Extract, Eclipta Prostrata Leaf Extract, Sargassum Muticum Extract, Hypnea Musciformis Extract, Ulva Lactuca Extract, Ecklonia Cava Extract, Codium Tomentosum Extract, Agarum Cribosum Extract, Enteromorpha Compressa Extract, Laminaria Japonica Extract, Dunaliella Alina Extract, Sargassum Fulvellum Extract, Porpjyra Yezoensis Extract, Fucus Vesiculosus Extract, Laminaria Saccarina Extract, Spirulina Plantensis Extract, Jania Rubens Extract, Gelidium Cartilagineum Extract, Macrocystis Porifera Extract, Algae Extract, Undaria Pinnatifida Extract, Codium Fragile Extract, Laminaria Cloustoni Extract, Chlorella Minutissima Extract, Hizikia Fusiforme Extract, Salicornia Herbacea Extract, Pikea Robusta Extract, Hydrolyzed Algae Extract, Hydrolyzed Ulva Lactuca Extract, Haematococcus Pluvialis Extract, Laminaria Digitata Extract, Hydrogenated Lecithin, Argania Spinosa Kernel Oil, Tocopheryl Acetate, PEG-14M, Trisodium EDTA, Dipropylene, Glycol, Dimethicone, Squalene, Hydrogenated Polyisobutene, Alcohol, 1,2-Hexanediol, Isononyl Isononanoate, Polyglyceryl-10 Stearate, Cetearyl Alcohol, Butyrospermum Parkii (Shea) Butter, Polyglyeryl-2 Dipolyhydroxystearate, Fructooligosaccharides, Lactobacillus/Algae Extract Ferment, Macrocystis Porifera (Kelp) Protein, Algae Oligosaccharides, Chlorella Ferment, Lecithin, Beta-Glucan, Inulin Laurel Carbamate, Hydrolyzed Hyaluronic Acid, Ceramide NP, Disodium Stearoyl Glutamte, Fragrance. Available at Mochi Beaute for $28 (130ml). 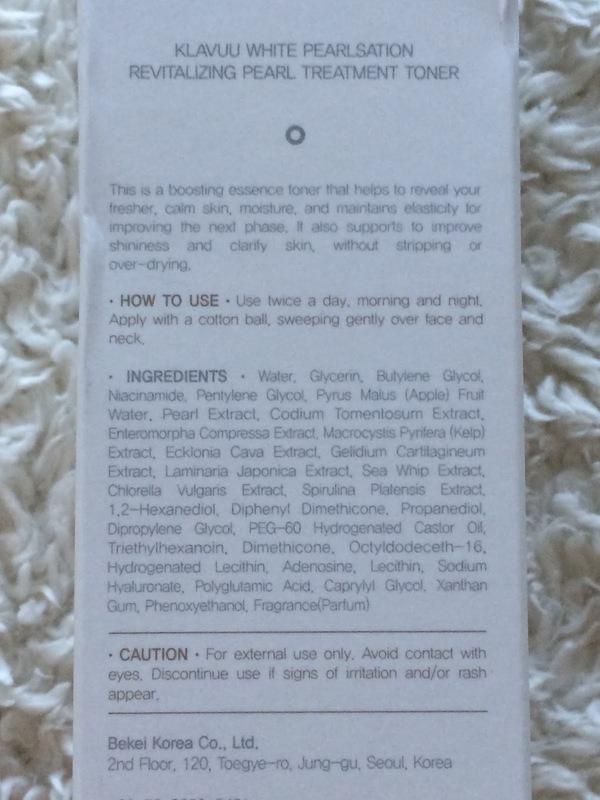 I purchased this toner because of it's whitening and anti-aging claims. Aside from acne, these are my other two biggest skin concerns, and I uhh... have an addiction to toners. This toner also acts as a booster for the products applied after. This toner comes in a frosted plastic bottle with a double layered screw-on cap. it looks so beautiful, doesn't it? The product dispenses through a shaker top, or euro dripper. 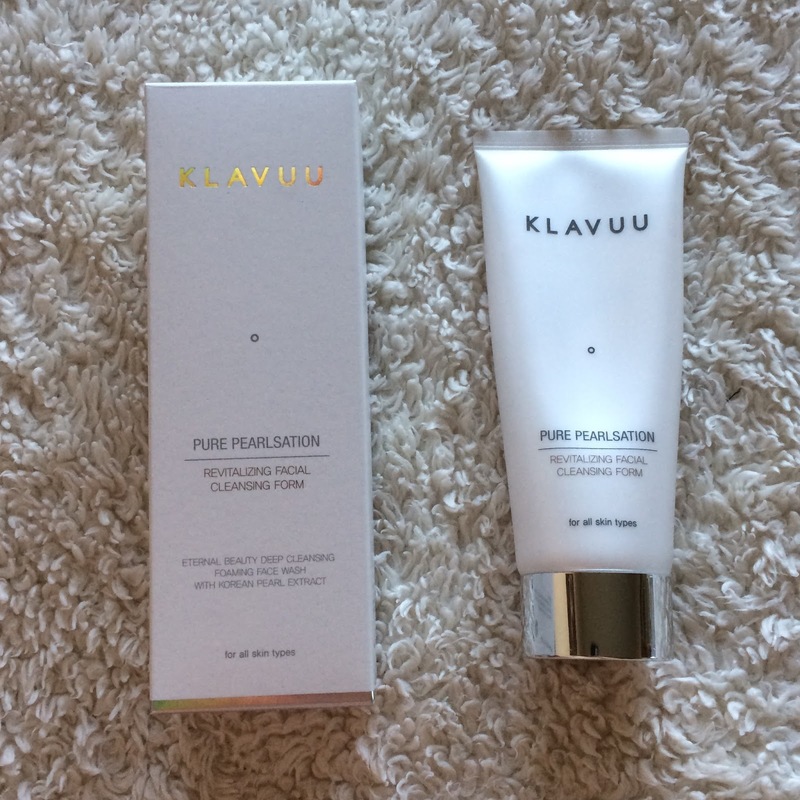 The Klavuu toner is white in color, with a floral vanilla scent. 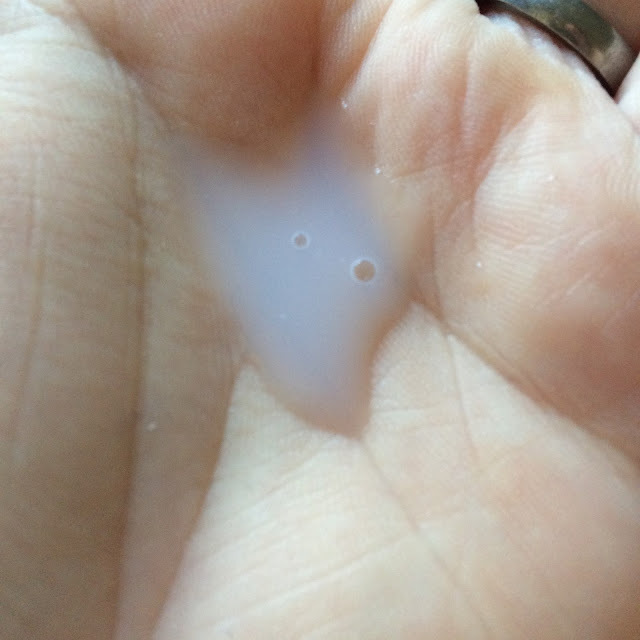 It's a bit thicker than water but still very runny, and absorbs quickly into the skin. 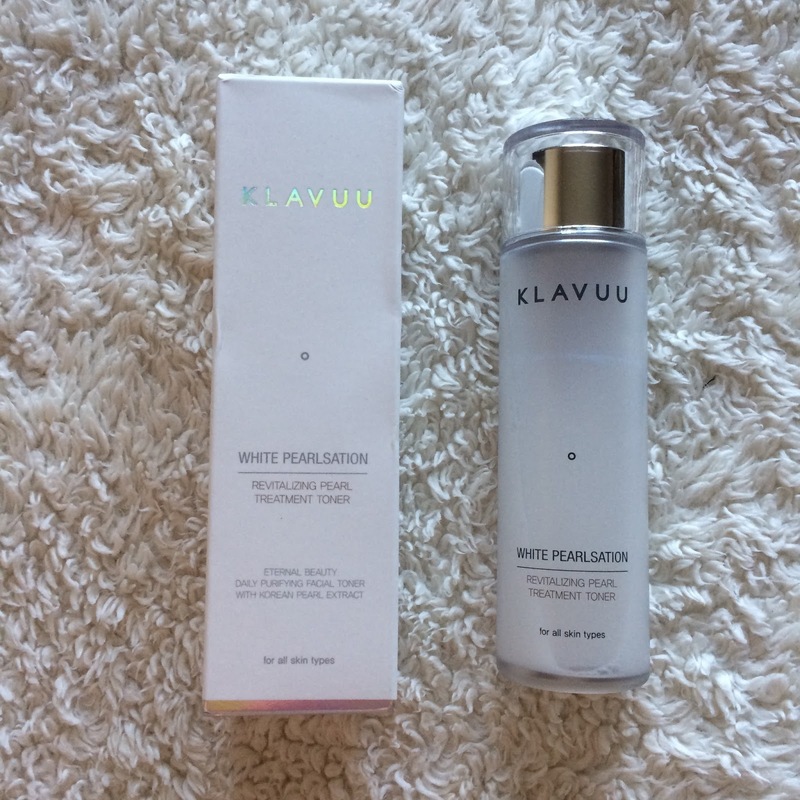 I find this toner to offer a bit of hydration, and makes my skin appear a bit brighter after application. This is a great prepping step for me, and I love the smell! Ingredients: Water,Glycerin, Butylene Glycol, Niacinamide,Pentylene Glycol, 1,2-Hexanediol, Biphenyl Dimethicone, Propanediol, Dipropylene Glycol, Phenoxyethanol, PEG-60 Hydrogenated Castor Oil, Triethylhexanoin, Xanthin Gum, Dimethicone, Pyrus Malus (Apple) Fruit Water, Octyldodeceth-16, Hydrogenated Lecithin, Adenosine, Lecithin, Fragrance(Parfum), Pearl Extract, Codium Tomentosum Extract, Ecklonia Cava Extract, Enteromorpha Compressa Extract, Macrocystis Pyrifera (Kelp) Extract, Gelidium Cartilaginous Extract, Laminaria Japonica Extract, Sea Whip Extract, Polyglutamic Acid, Sodium Hyaluronate, Chlorella Vulgaris Extract, Spirulina Platensis Extract, Caprylyl Glycol. Available at Mochi Beaute for $38 (140ml). This serum is also used in the Klavuu sheet mask, which I had tried prior and loved, so I could hardly wait to try the actual serum. Like the rest of the Pearlsation line, this serum fights aging and brightens the skin. It also claims to soothe and heal blemishes. 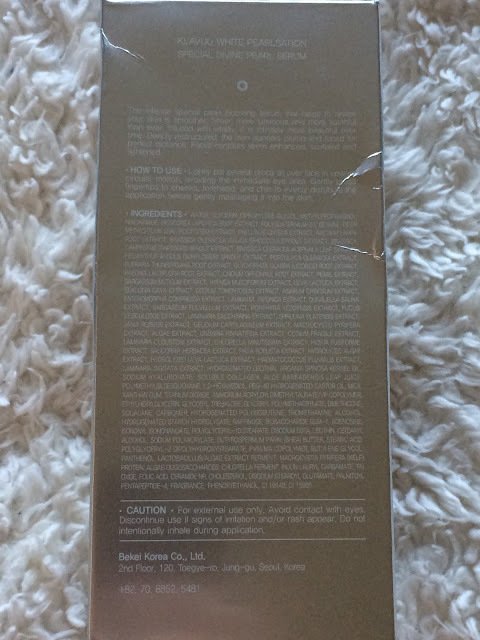 I feel like the serum packaging stands out the most in this line, because the bottle is all silver. 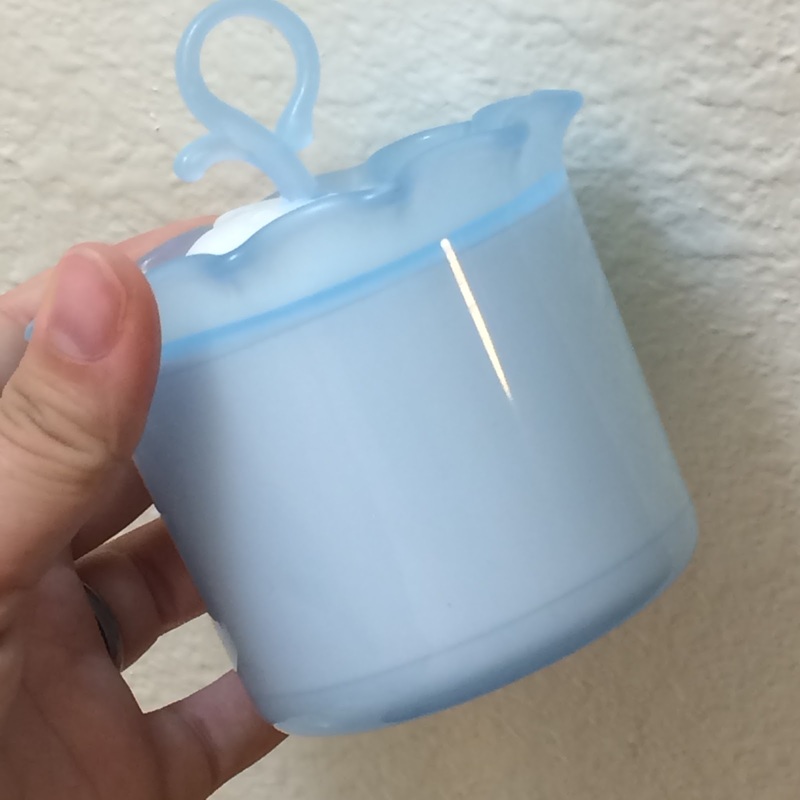 Under the cap is a easy-to-dispense pump top. 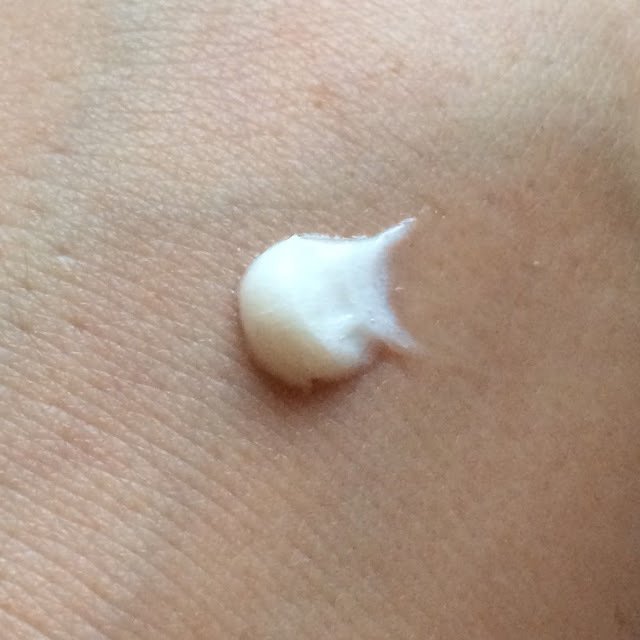 The serum is thicker, like an emulsion, and has a white pearl color. It has a floral scent with a hint of vanilla. 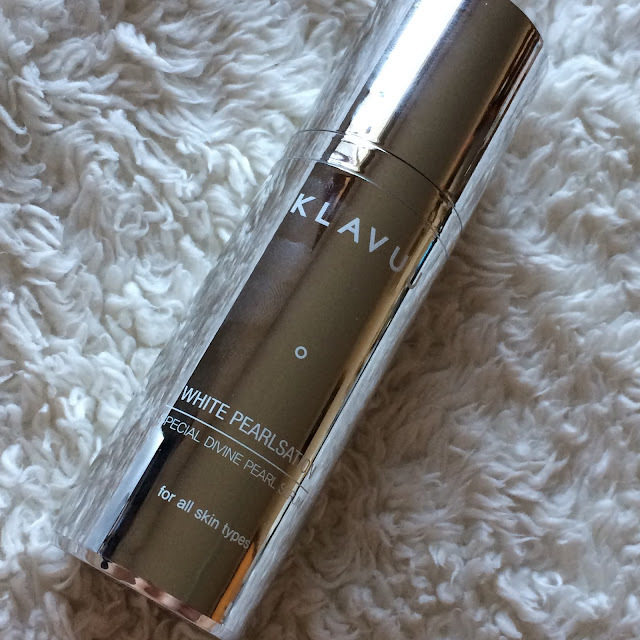 When I use this serum I notice my skin has a nice healthy glow. 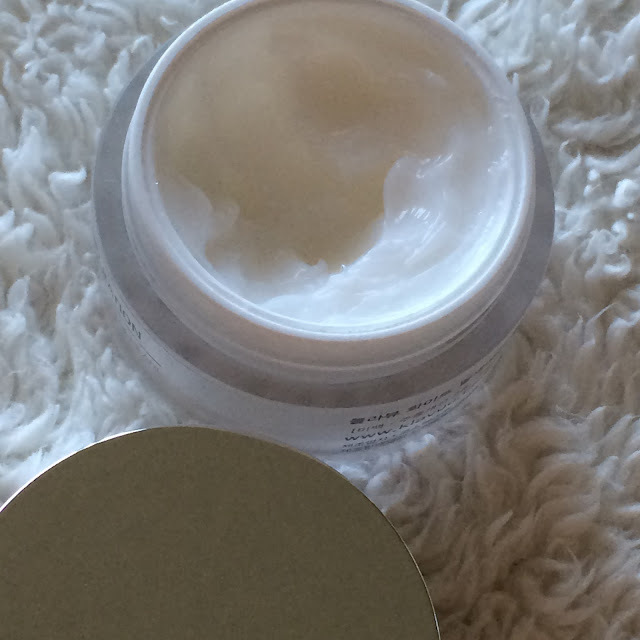 The texture feels smoother, my complexion looks brighter, and my skin feels more hydrated. 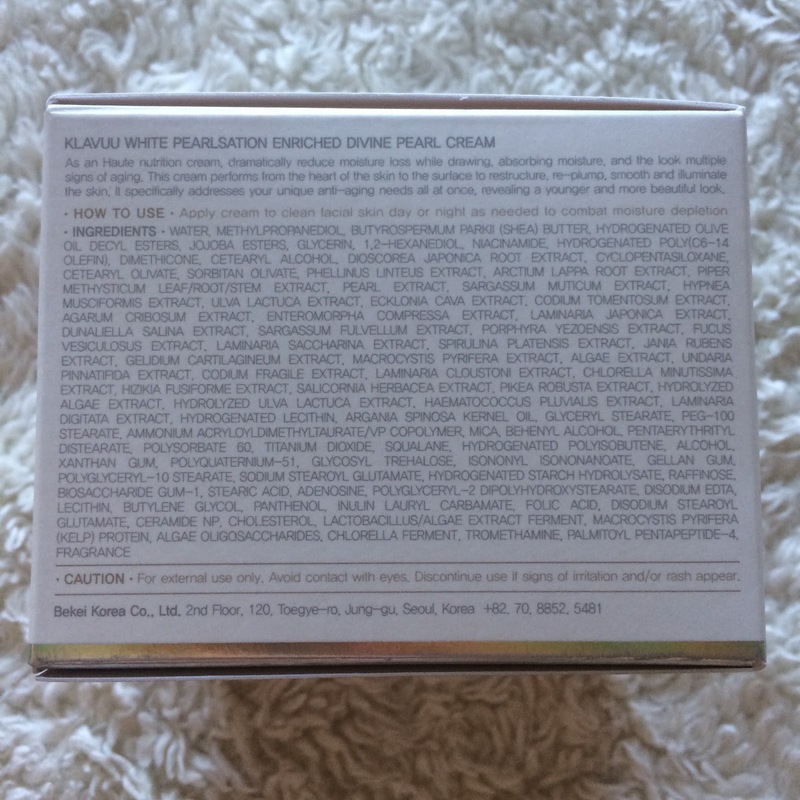 Ingredients: Water, Glycerin, Dipropylene Glycol, Glycereth-26, Methylpropanediol, Cyclopentasiloxane, Niacinamide, BIFIDA Ferment Lysate, Raffinose, Dioscorea, Japonica Root Extract, 12-Hexanediolm Diglycerin, BIS-PEG-18 Methyl Ether Dimethyl Silane, Pentylene Glycol, Piper Methysticum Leaf/Root/Stem Extract, Beta Vulgaris (beet) Root Extract, Phellinus Linnets Extract, Arctic Lappa Root Extract, Portulaca Oleracea Extract, Pueraria Thunbergiana Root Extract, Glycyrrhiza Glabra (Licorice) Root Extract, Paeonia Lactiflora Root Extract, Conidium Officinale Root Extract, Brassica Oleracea Italica (Broccoli) Sprout Extract, Brassica Campestris (Rapeseed) Sprout Extract, Brassica Oleracea Acephala Leaf Extract, Helianthus Annuus (Sunflower) Sprout Extract, Pearl Extract, Sargassum Multicum Extract, Hypnea Musciformis Extract, Ulva Lactuca Extract, Ecklonia Cava Root Extract, Codium Tomentosum Extract, Agarum Cribosum Extract, Enteromorpha Compressa Extract, Laminaria Japonica Extract, Dunaliella Salina Extract, Sargassum Fulvellum Extract, Porphyry Yezoensis Extract, Fucus Vesiculosus Extract, Laminaria Saccarina Extract, Spirulina Plantensis Extract, Jania Rubens Extract, Gelidium Cartilaginous Extract, Macrocystis Porifera Extract, Algae Extract, Undaria Pinnatifida Extract, Codium Fragile Extract, Laminaria Cloustoni Extract, Chlorella Minutissima Extract, Hizikia Fusiforme Extract, Salicornia Herbacea Extract, Pikea Probusta Extract, Hydrolyzed Algae Extract, Hydrolyzed Ulva Lactuca Extract, Haematoccus Pluvialis Extract, Laminaria Digitata Extract, Hydrolyzed Lecithin, Soluable Collagen, Aloe Barbadensis Leaf Juice, Arganil Spinosia Kernel Oil, Sodium Hyaluronate, Dimethicone, MICA, Dimethicone Crosspolymer, Hydrolyzed Corn Starch, Butylene Glycol, Titanium Dioxide, Acrylates/C10-30 Alkyl Acrylate Crosspolymer, Tromethamine, Ceramide NP, Ethylhexylgycerin, Polyquaternium-51, Glycosyl, Trehalose, Laureth-4, Squalene, Hydrolyzed polyisobutene, Laureth-23, Glyceryl Polymethacrylate, Xantham Gum, PEG-10, Rapeseed Sterol, Alcohol, Hydrolyzed Starch Hydrolysate, Biosaccharide Gum-1, Adenosine, Isononyl, Isononanoate, Polyglyceryl-10 Stearate, Cetearyl Alcohol, Sodium Polyacrylate Butyrospermum Parkii (Shea) Butter, Stearic Acid, Polyglyceryl-3 Dipolyhydroxystearate, PVM/MA Copolymer, Glyceryl Stearate, Carbomer, Glycereth-20, Polysorbate 20, Lactobacillus/Algae Extract Ferment, Macrocystis Pyrifera (Kelp) Protein, Algae Oligosaccharides, Chlorella Ferment, Inulin Lauryl Carbamate, Acetic Acid, Lactic Acid, Disodium Stearoyl Glutamate, Palmitoyl Pentapeptide-4, Fragrance, Potassium Sorbate. Available at Mochi Beaute for $45 (33ml). I generally have mixed feelings about eye creams, but this just happens to be one that I enjoy using. This cream claims to improve elasticity and decrease dark circles and wrinkles around the eye area. The eye cream comes in a frosted plastic jar with a silver lid. Like the rest of the line, I find this eye cream to have a floral vanilla scent, but it's less fragranced than the other products in this post. The texture is thick and creamy. It spreads easily and doesn't feel heavy, but it does leave a moist layer on the skin for a while. I personally don't find this to be an issue but I haven't tried applying makeup over the top to see how it works during the day. Without makeup, however, I find this eye cream works well both day and night. 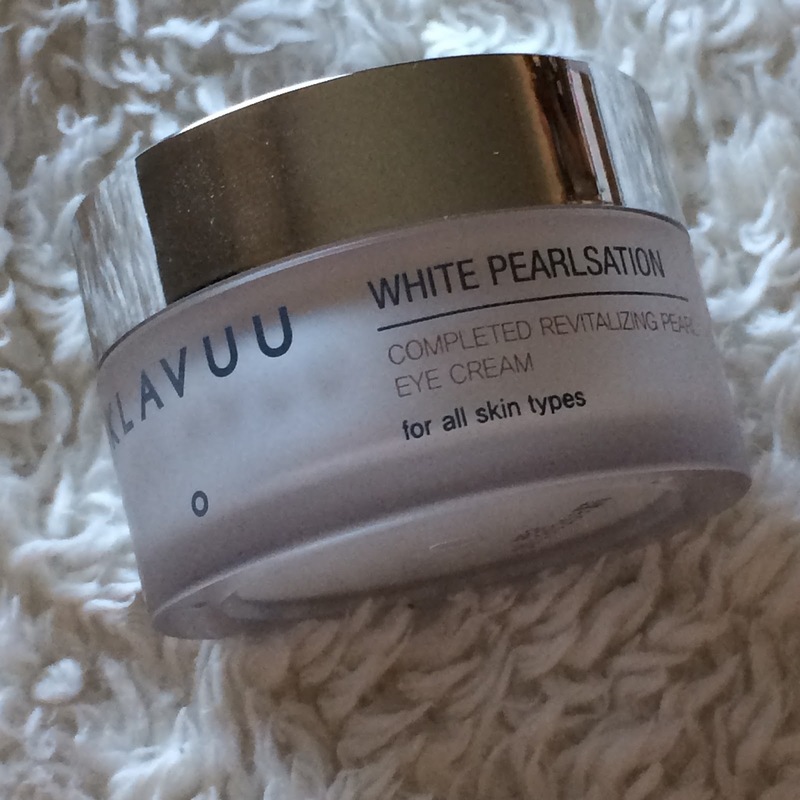 I love this eye cream because it delivers great hydration without irritating my eye area or causing milia. I do feel like I look less tired, and my eye area is brighter, when I use this eye cream as well. Ingredients: Water, Dipropylene Glycol, Cyclopentasiloxane, Cetearyl Alcohol, Ethylhexyl Palmitate, Glycerin, Cyclohexasiloxane, Dimethicone, Butylene Glycol, Glycereth-26, Niacinamide, Caprylic/Capric/Myristic/Triglyceride, Glyceryl Stearate SE, Pearl Extract, Macadamia Ternifolia Seed Oil, Codium Tomentosum Extract, Enteromorpha Compressa Extract, Macrocystis Pyrifera (Kelp) Extract, Ecklonia Cava Extract, Gelidium Cartilagineum Extract, Laminaria Japonica Extract, Sea Whip Extract, Chlorella, Vulgaris Extract, Spirulina Platensis Extract, Pentylene Glycol, Glyceryl Stearate, PEG-100 Stearate, Ammonium Acryloyldimethyltaurate/VP Copolymer, Sorbitan Stearate, Caprylyl Glycol, Sodium Polyacrylate, Adenosine, Arginine, Ceramide 3, Phytosphingosine, 12-Hexanediol, Xanthan Gum, Disodium EDTA, Phenoxyethanol, Fragrance (Parfum). Available at Mochi Beaute for $45 (20ml). Facial creams are my second weakness, but not because I love to layer them as I do toners, but because it's often so difficult for me to find ones that work for me. 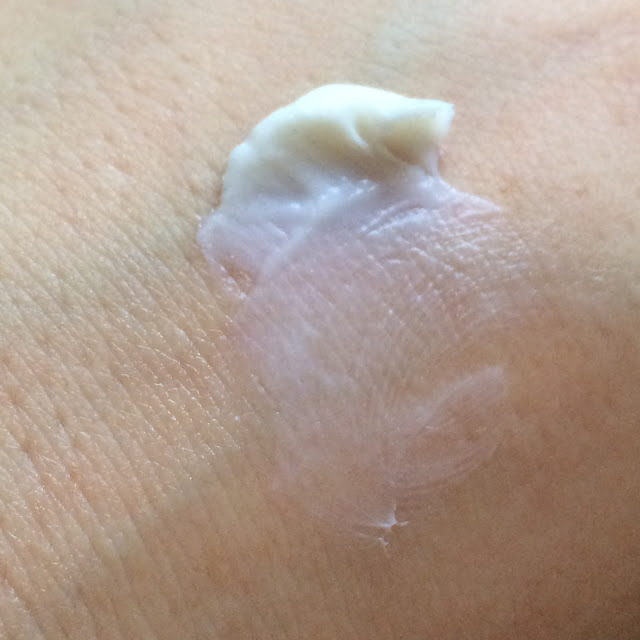 I'll admit I was worried about this cream just as I am with any new cream, but I was pleasantly surprised! This cream claims to bring out the best condition of your skin and provide anti-aging properties. 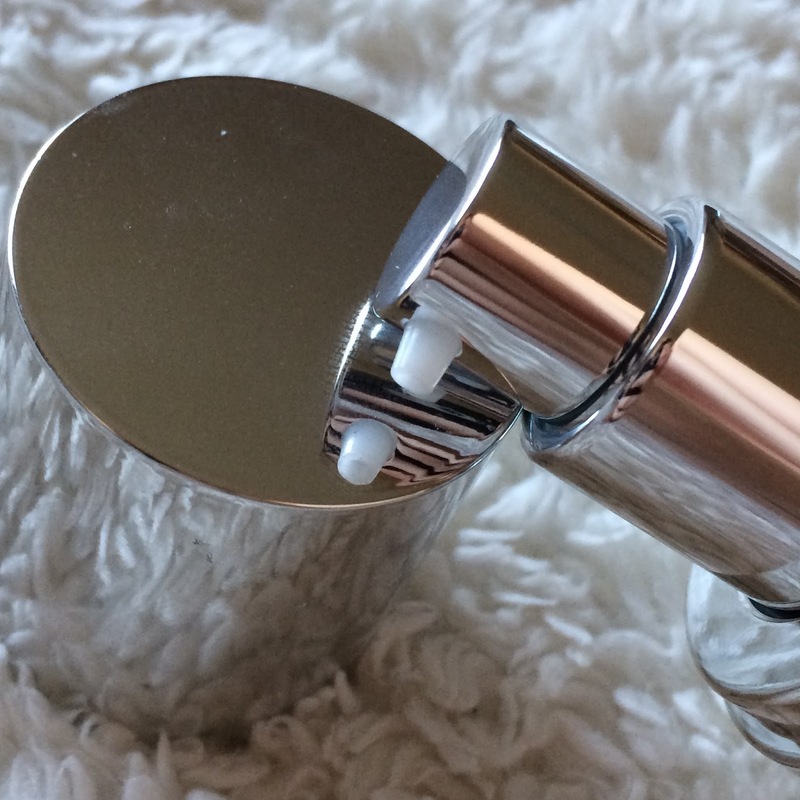 Just like the eye cream, the facial cream comes in a frosted plastic jar with a silver lid. Again, this cream has a floral vanilla scent. 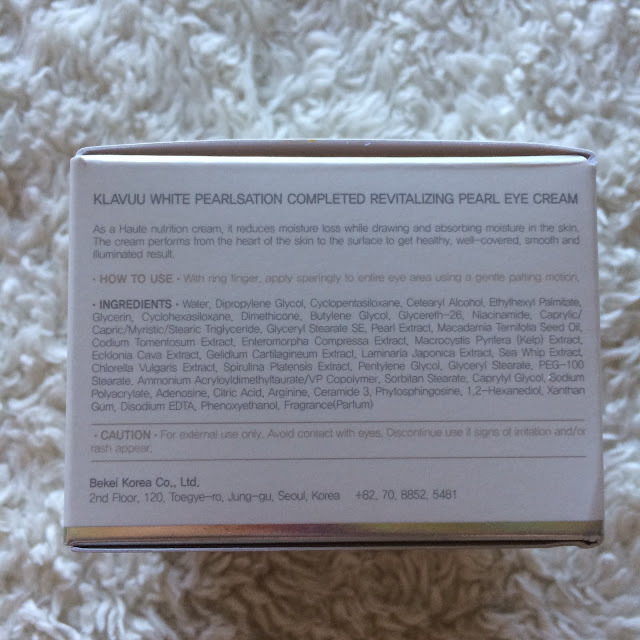 It has a bit of a thicker texture than the eye cream, and it more cream in color than white. Surprisingly though, this cream absorbs into my skin quickly and leaves behind a smooth finish. 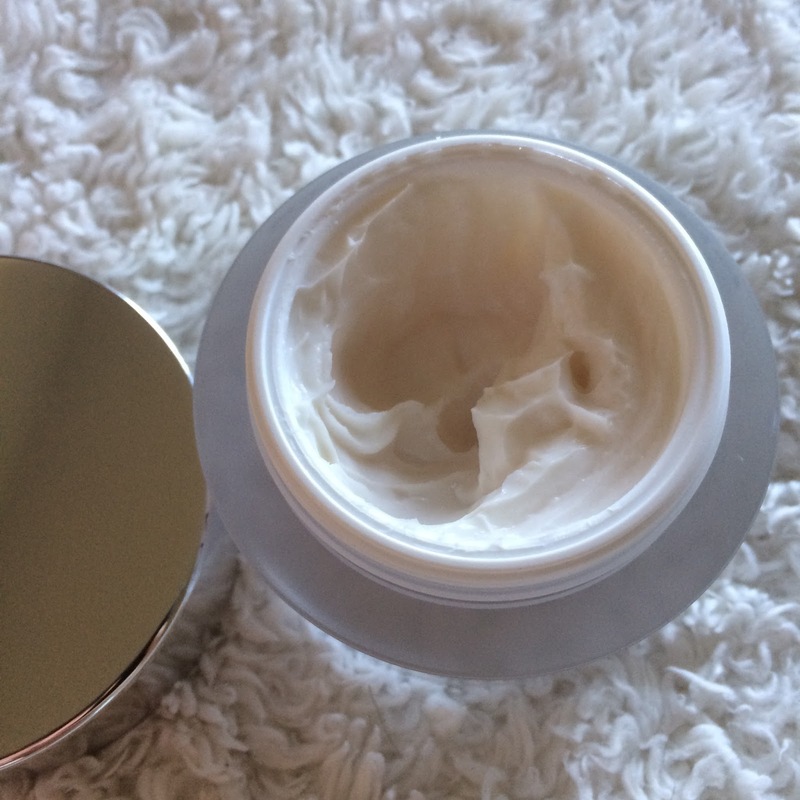 I am very pleased to report that this cream does not break me out, and has been a perfect hydrating component to my routine both day and night. 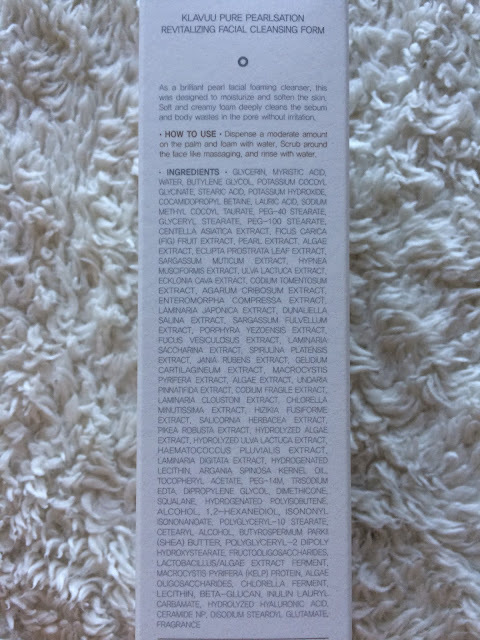 Ingredients: Water, Methylpropanediol, Butyrospermum Psrkii (Shea) Butter, Hydrogenated Olive Oil, Decylesters, Jojoba Esters, Glycerin, 1,2-Hexanediol, Niacinamide, Hydrogenated Poly (c6-14 Olefin), Dimethicone, Cetearyl, Alcohol, Dioscorea, Japonica Root Extract, Cyclopentasiloxane, Cetearyl Olivate, Sorintan Olivate, Phellinus Linteus Extract, Arctic Lappa Root Extract, Piper Methysticum Leaf/Root/Stem Extract, Pearl Extract, Sargassum Muticum Extract, Hypnea Musciformis Extract, Ulva Lactuca Extract, Ecklonia Cava Extract, Codium Tomentosum Extract, Agarum Cribosum Extract, Enteromorpha Compressa Extract, Laminar Japonica Extract, Dunaliella Salina Extract, Sargassum Fulvellum Extract, Porphyra Yezoensis Extract, Fucus Vesiculosus Extract, Laminar Saccharina Extract, Spirulina Platensis Extract, Jania Rubens Extract, Gelidium Cartilagineum Extract, Macrocystis Pyrifera Extract, Algae Extract, Undaria Pinnatifida Extract, Codium Fragile Extract, Laminar Cloustoni Extract, Chlorella Minutissima Extract, Hizikia Fusiform Extract, Salicornia Herbacea Extract, Pikea Robusta Extract, Hydrolyzed Algae Extract, Hydrolyzed Ulva Lactic Extract, Haematococcus Pluvialis Extract, Laminar Digitata Extract, Hydrogenated Lecithin, Arganil Spinosa Kernel Oil, Glyceryl Stearate, PEG-100 Stearate, Ammonium Acryloyldimethyltaurate/VP Copolymer, MICA, Mehenyl Alcohol, Pentaerythrityl Distearate, Polysorbate 60, Titanium Dioxide, Squalene, Hydrogenated Polyisobutene, Alcohol, Xanthin Gum, Polyquaternium-51, Gylcosyl Trehalose, Isononyl Isononanoate, Gellan Gum, Polyglyceryl-10 Stearate, Sodium Stearoyl Glutamate, Hydrogenated Starch Hydrolysate, Raffinose, Biosaccharide Gum-1, Stearic Acid, Adenosine, Polyglyceryl-2 Dipolyhydroxystearate, Disodium EDTA, Lecithin Butylene Glycol, Panthenol, Inulin Lauryl Carbamate, Folic Acid, Disodium Stearoyl Glutamate, Ceramide NP, Cholesterol, Lactobacillus/Algae Extract Ferment, Macrocystis Porifera (Kelp) Protein, Algae Oligosaccharides, Chlorella Ferment, Tromethamine, Palmityloyl Pentapeptide-4, Fragrance. Available at Mochi Beaute for $58 (50ml). 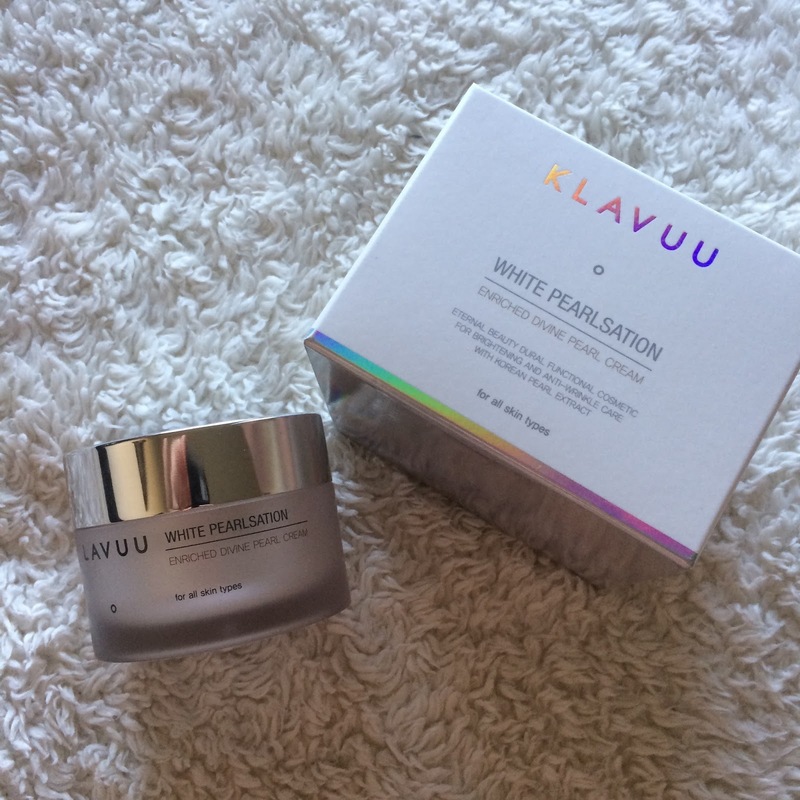 Overall, the Klavuu Pearlsation line is a great combination of skincare products. If you're looking for products that offer brightening, anti-aging, or hydrating properties I highly suggest checking them out! Be sure to sign up for Mochi Beaute's newsletter for exclusive discounts and to keep up on sales and new releases! 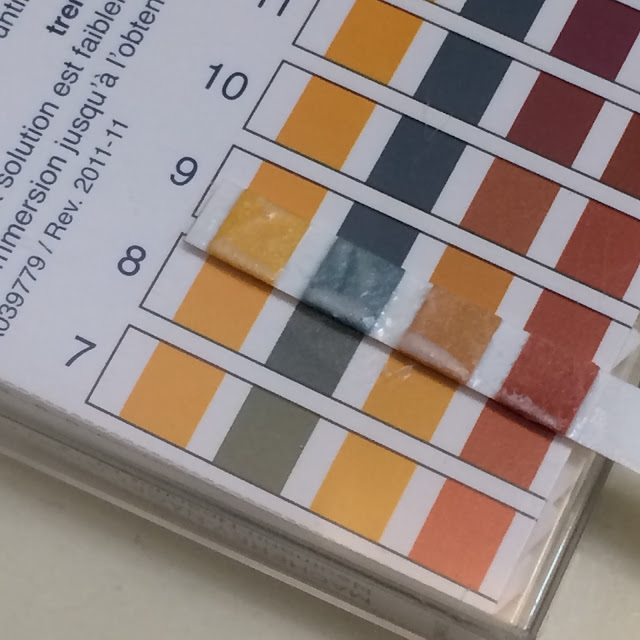 I have to recalibrate my PH meter again... I got way way lower. I will buy a new bottle of distilled water and put that on my list. #AsianBeauty Xmas #Giveaway - 2 Prizes!